The Washington, D.C. area has a wide range of theaters where you can enjoy the Christmas classic ballet, The Nutcracker. Take the whole family to marvel over Clara’s Christmas fantasy when the wooden toy soldier comes alive and takes her on a magical tour of wonderful holiday adventures. Find the theater that best suits your style and budget. Get tickets early to get the best seats. There are performances for 2018 in Washington, D.C., Maryland and Northern Virginia. There are also numerous Holiday Concerts in the Washington, D.C. area to round out your holiday entertainment calendar. Kennedy Center - Ballet West will perform with the Kennedy Center Opera House Orchestra and the Arlington Children's Chorus Wednesday, December 5, 2018 - Sunday, December 9, 2018. Warner Theatre - The Nutcracker is performed by the Washington Ballet from November 29 - December 28, 2018, at this historic theatre. Set to Tchaikovsky’s magical score, this charmingly-Washington, D.C. production set in 1882 Georgetown is a holiday tradition. With General Washington as the Nutcracker, George III as the Rat King, and other historical figures, the story comes to life with over 100 dancers, stunning set designs, and original costumes. Momentum Dance Theatre - Jazz Hip Hop Nutcracker will be performed at Wilson High School, 3950 Chesapeake St. NW Washington, D.C. December 15 - December 16, 2018. Momentum Dance Theater presents an original modern spin on the traditional holiday show and has been wowing and charming audiences since 2000. The Puppet Co. - The Nutcracker performances from November 23, 2018 - December 30, 2018. Enjoy this child-friendly version of the holiday classic. Glen Echo Park 7300 MacArthur Boulevard, Glen Echo, Maryland. This is the Puppet Co.'s annual holiday treat and has been a family tradition for three generations. Metropolitan Ballet Theatre -The Nutcracker is performed at the Robert E Parilla Performing Arts Center, Montgomery College, 51 Mannakee St., in Rockville, Maryland. Metropolitan Ballet Theatre has been presenting the full-length traditional staging of The Nutcracker in Rockville at Montgomery College since 1989. Performances feature student and professional dancers, fabulous costumes, and beautiful scenery. Performance dates are Friday, November 30, 2018, Saturday, December 1 and 8, 2018, and Sunday, December 2 and 9, 2018. Rockville Civic Ballet performs The Nutcracker at the Scott Fitzgerald Theatre, 603 Edmonston Drive, Rockville, Maryland on December 2 -10, 2018. Maryland Youth Ballet performs The Nutcracker at the Robert E. Parilla Performing Arts Center, 51 Mannakee St., Rockville, Maryland on December 8 and 9, 2018. Music Center at Strathmore - Moscow Ballet's Great Russian Nutcracker by CityDance is performed at 5301 Tuckerman Lane, N. Bethesda, MD. Over 60 local youth have been selected to perform alongside the Russian professionals in Moscow Ballet’s production on December 16 and 17, 2018. In addition, the Music Center at Strathmore hosts a performance of a Hip Hop Nutcracker on December 18, 2018. Gainesville Ballet School performs The Nutcracker at the Hylton Performing Arts Center, 10960 George Mason Circle, Manassas, Virginia on Friday, November 23, 2018. The full-length ballet features international guest dancers, faculty and students of the award-winning arts organization. Classical Ballet Theater The Nutcracker is performed at the Ernst Community Cultural Center, Northern Virginia Community College, 8333 Little River Turnpike in Annandale, Virginia on November 24 and 25, 2018. Metropolitan School of the Arts hosts The Nutcracker at the Ernst Community Cultural Center, Northern Virginia Community College, 8333 Little River Turnpike, Annandale, Virginia on December 8 and 9, 2018. “Nutcracker in a Nutshell,” a 30-minute version for younger audiences is performed at the Metropolitan School of the Arts at 5775 Barclay Road in Alexandria, Virginia on November 25, 2018. In addition, there is a special program for Girl Scouts when the Nutcracker performances take place on December 8 and 9, 2018 at the Rachel M. Schlesinger on the Alexandria campus of Northern Virginia Community College. They offer $15 tickets to groups of 10 or more to all shows. All Girl Scouts will receive a Nutcracker Patch. At the 1 p.m. shows, they will offer a workshop for all Girl Scouts in attendance and they have the opportunity to meet some of the dancers. Fairfax Symphony Orchestra presents The Nutcracker at the George Mason University Center for the Arts, in Fairfax, Virginia on Sunday, December 16, 2018. The FSO and the Fairfax Ballet present this timeless holiday classic. Fairfax Ballet Company - The Nutcracker is performed at W.T. Woodson High School, Fairfax, Virginia. Center for Ballet Arts presents The Nutcracker at the Rachel Schlesinger Concert Hall, 4915 E Campus Dr, Alexandria, Virginia. Virginia Ballet Company and School performs The Nutcracker at the Ernst Community Cultural Center, Northern Virginia Community College, 8333 Little River Turnpike, in Annandale, Virginia on December 27, 28 and 29, 2018. 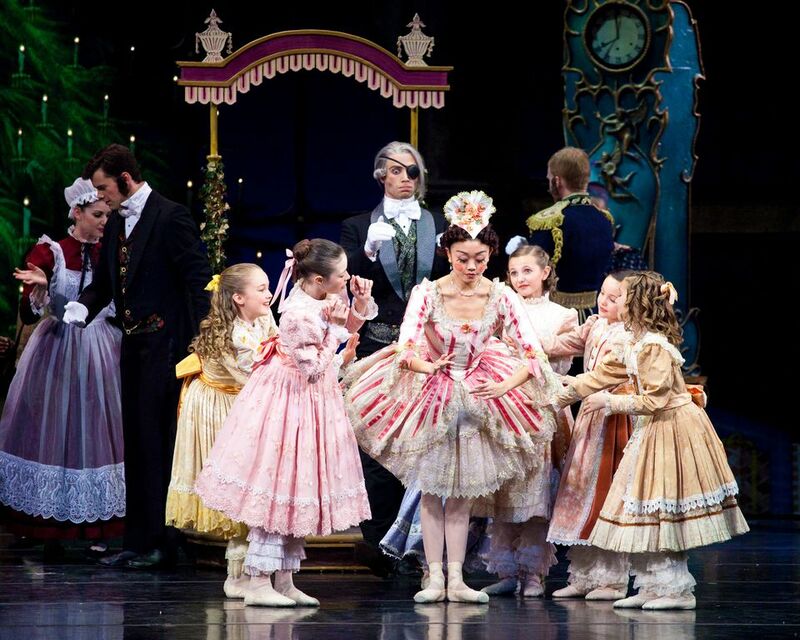 Conservatory Ballet performs The Nutcracker, both a full-length and children's matinee performance at CenterStage, 2310 Colts Neck Road, in Reston, Virginia on December 9, 2018. See Great Holiday Shows in Washington, D.C.